Now in their fourteenth year, the sports awards recognise the achievements of the borough's sporting talent who have participated at local, county or national levels in various events over the past year. There are 9 award categories; see the criteria for each award below. You can also download and complete the Hackney sports awards nomination form [pdf, 762.69KB]. The closing date for nominations is 8 November. Recognising an individual or group who have made a significant contribution in the development and delivery of opportunities for people with disabilities. 1. Either a organisation, club or individual has made significant achievements within disability sport provision. 2. How has the organisation, club or individual worked in partnership with others to increase opportunities for Hackney residents. 3. What qualities has the organisation, club or individual demonstrated that sets them apart from others. 4. Encouraged more people to participate in their sport or activity and helped people improve their skills and level of performance. Recognising an individual coach who has made an outstanding contribution to an individual or Hackney club, project or organisation. 1. The individual holds the relevant national governing body qualifications. 2. There is evidence to show how the coach has helped the club/organisation to develop and progress. 3. Increased participation by inspiring and encouraging others to progress in their sport. 4. Used innovative ideas to promote, develop and enhance their delivery. To recognise excellent club development work within Hackney for the benefit of the local communities in the past year. 1. Attained club mark, or are actively working towards it and affiliated to the relevant national governing body. 2. Encouraged more people to participate in their sport or activity and helped people improve their skills and level of performance. 3. Evidence of a commitment to effective recruitment, recognition and training in the past year. 4. Established development pathways with local schools and organisations in the past year. This award recognises an under 18 team who has achieved outstanding success or achievements within their sport. 1. A Hackney team who have had outstanding success / achievements within sport; (80% of the team must be Hackney residents or attend a Hackney school during the time of the achievement). 2. Shown significant improvement from the previous year. 3. Demonstrated fair play and good sporting attitude both in and out the sporting arena. This award recognises an individual who has had outstanding success/achievements within their chosen sport. 1. Individual has had significant achievement/success within their sport (list achievements). 2. Made a significant impact on sport in Hackney. 3. Illustrate how their success is different from others in their sport and how they are a role model. 4. Exceeded expectations in their sporting performance or made a significant difference to a team. 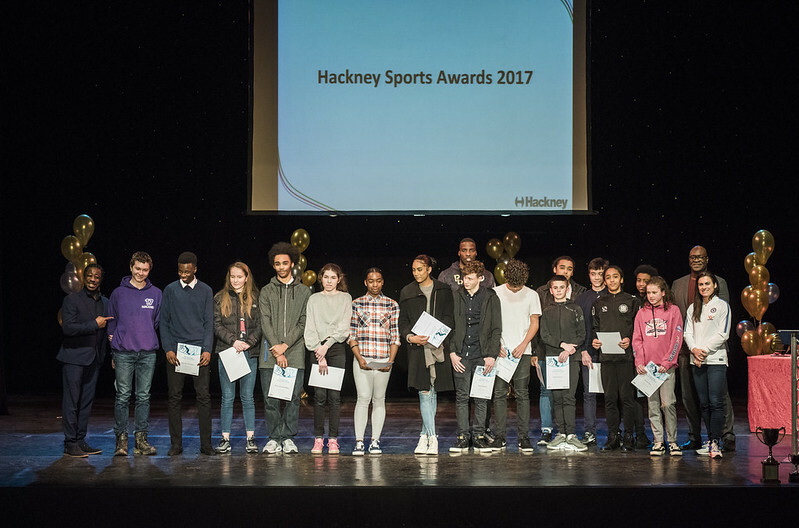 Hackney's sports men and women were honoured at the Hackney Youth Sports Awards 2018 on Wednesday 5 December at Hackney Town Hall. Special guests on the night were Hackney born sporting stars Noah Williams and Orlan Jackman. Noah Williams represented Great Britain, specialising in the 10m platform event and he has won silver medals in the 10m synchro platform with Matthew Dixon at the European Championships and the Commonwealth Games. Orlan Jackman represented Great Britain and the London City Royals Basketball Teams, was the winner of the Division B Europeans at 18 and under 20s, and played in the Commonwealth Games 2018. An audience of 200 people enjoyed the awards and the Q&A with both Orlan and Noah. The London Youth Games individual medallists over the age of 11 received a year's free GLL membership to access Hackney's Better leisure centres.